Maryland’s injury-riddled season continued with the announcement that 7-foot-1 senior center Michal Cekovsky didn’t accompany the Terps for their game Wednesday night against No. 3 Purdue. Cekovsky has an injured left heel, a team spokesman said. The extent of the injury and how long Cekovsky will be out were not announced before the game and are expected to be addressed by coach Mark Turgeon afterward. Cekovsky was injured in practice Tuesday and saw a doctor Wednesday. If serious enough to require surgery, the injury would mark the end of Cekovsky’s college career. Cekovsky missed the last seven games of his junior year with a broken left ankle, with Maryland losing five, including quick exits from the Big Ten and NCAA tournaments. Despite a lengthy rehabilitation that lasted into the summer, he had played in all but one game for the Terps this season. After losing forwards Justin Jackson and Ivan Bender last month with season-ending injuries, and now Cekovsky, Maryland is down to eight healthy scholarship players and only three big men: 6-10 freshman Bruno Fernando, 6-9 redshirt freshman Joshua Tomaic and 6-9 graduate student Sean Obi. 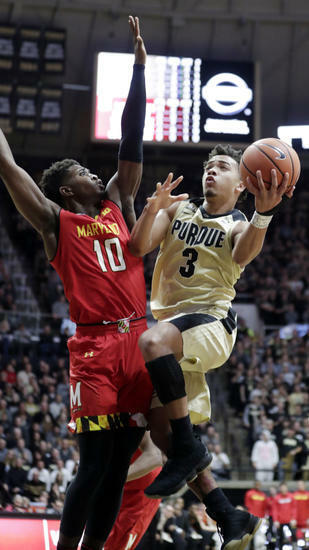 Fernando will likely start against the Boilermakers and 7-2, 290-pound senior Isaac Haas, who scored 21 points on 10-for-13 from the field against the Terps in Purdue’s 80-75 victory in the Big Ten opener Dec. 1 in College Park. Fernando is still not 100 percent healthy after spraining his right ankle for the second time this season early in the second half against Indiana on Jan. 21. It was the third time Fernando had suffered a sprained ankle since coming to Maryland. He initially sprained his right ankle against Ohio University in December and missed two games. He suffered a more serious high left ankle sprain in preseason. He has also been recently slowed by illness. After getting his first career double double with 17 points and 11 rebounds in a Jan. 2 win over Penn State, then scoring a career-high 21 points against Iowa two games later, Fernando was named the Big Ten’s Freshman of the Week. He then battled flu-like symptoms and has scored just 20 points in five subsequent games. Considering that the Terps will face Haas and Wisconsin’s Ethan Happ in back-to-back games, they need to get Fernando healthy and get him help. Maryland will host the struggling Badgers on Sunday. Wisconsin (10-13, 3-7), which lost three starters from a Sweet 16 team last season, has dropped six of its past seven games. Tomaic’s playing time has fluctuated from barely any at the beginning of the season to averaging nearly 18 minutes over a recent five-game stretch to just 12 minutes the past two games, including only two in Sunday’s 74-68 home loss to then-No. 6 Michigan State. Obi, who started his career at Rice and averaged nearly a double double as a freshman before transferring to Duke, has played infrequently this season. He has averaged under six minutes in the 15 games he has played, with a season-high 16 in the 30-point loss at then-No. 1 Michigan State on Jan. 4. Cekovsky, who had season highs of 17 points and four blocked shots in Maryland’s 77-66 win over Minnesota on Jan. 18, had struggled the past two games before suffering the injury, going scoreless in 21 minutes against Indiana and getting just three rebounds in 23 minutes against the Spartans. Turgeon also referenced the fact that Cekovsky had played the season virtually injury-free. Within a couple of hours, Cekovsky was being helped off the practice court as Maryland’s injury-riddled season continued. 0 Response to "Michal Cekovsky out for Maryland against No. 3 Purdue tonight with left heel injury"